A small space bathroom can work well and give you the same delight of having bath if you do not clutter it with unnecessary things. It can be made spacious by applying refreshing shades, fitting accessories and proper lighting and flooring. A well organized bathroom in small space not only makes the place elegant but refreshes our body and mind also. Thus designing for small space bathroom gives us the ecstasy of taking the bath. Here are some tips that you can try for making your small bathroom look airy, large and spacious. Apply blue color which is a receding color and always opens up small spaces. 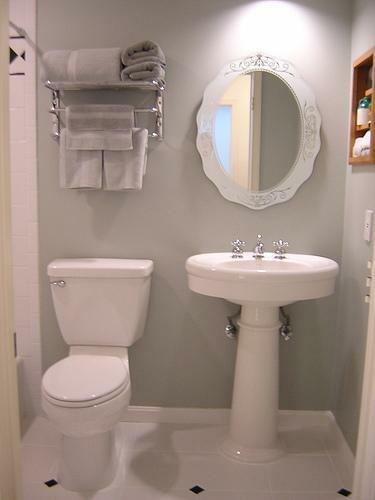 Use light colors on walls and ceiling in small spaces so that your bathroom may look large, open and airy. Use soft and cool colors for doors, cabinets as it makes bathroom larger. Avoid dark/strong colors in bathroom such as red, orange and bright yellow. 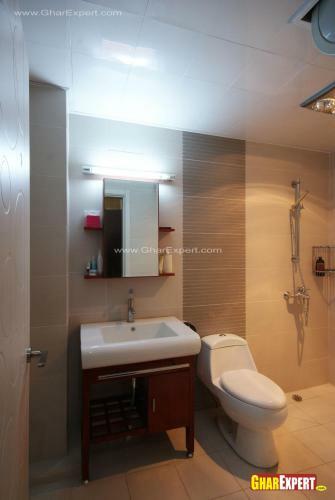 Apply different colorful lighting which makes small bathroom looks bigger or changes into cozy bathroom. Adjust lighting in proper way for enlargement of space. 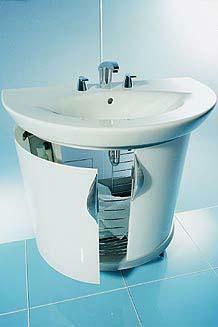 Use circular or round washbasin which makes bathroom spacious and washbasin in corner also saves space. 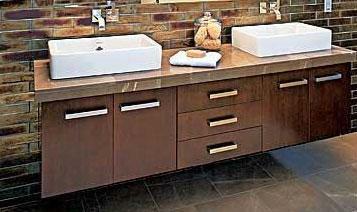 Use the space under washbasin for storage purpose by providing cabinets. Provide washbasin in the recess of walls and fix waste water pipe of washbasin into the wall also. This will not take any space and will not create nuisance also. Use wall hung sinks as they are suitable for small space. Provide open cabinets into the recess of walls for placing soap shampoo etc. without taking any extra space. Adjust shower over bath taps, not in a separate area to save the space. Do not use small accessories as these make clutter into the room. 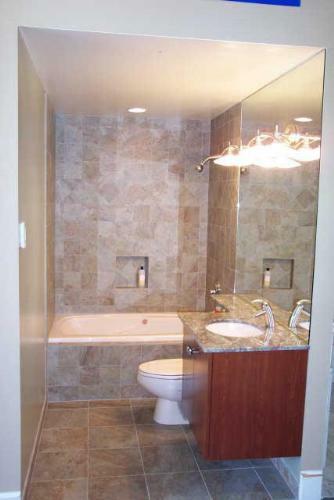 Provide white color tiles and white color paints on walls for spacious feeling in a small bathroom. Fix acrylic sheet or marble corners into the corner of bathroom; which can be used for placing daily routine items without taking any extra space. Light color flooring makes the bathroom look spacious. 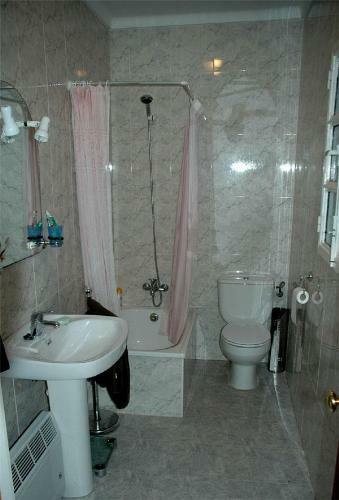 Use half- length tiles having small sizes in bathroom. Provide sliding door or a door which opens outwards when it is opened. Provide simple glass panel or acrylic wall which divides laboratory from shower area which takes less space. Do not keep old or unused items in bathroom. This will take unnecessary space and create nuisance. Apply corner bath which is still a practical option to save space. Always keep bathroom neat and clean which makes it look bigger. Bathroom requires careful planning otherwise you can face some big problems of water leakage, slippery floor and poor ventilation. To avoid some mistakes in bathroom design find out some facts. Taking bath in a clean bathroom keeps your body and mind refreshed throughout the day whereas a smelly bathroom has adverse effects on the health of occupants and creates unhygienic environment. Just read this article to know some useful tips for elimination of bathroom odor. Glass never goes out of style and creates an absolute amazing and interesting environment within your bathroom. If you use more glass in your bathrooms, then it will look more appealing and mysterious. Glass not only offers a unique look to your bathroom but also make the bathroom look spacious. 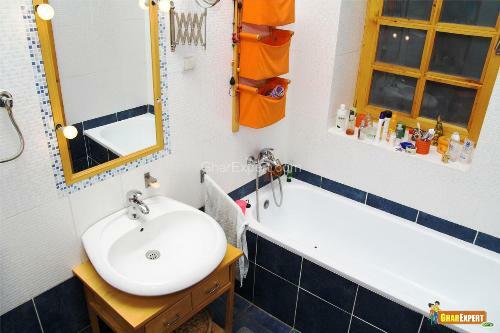 Decorating your bathroom is vital to exceeding the bland and generic stock bathrooms. All the articles found here contain helpful information about bathroom accessories, bathroom lighting, shelves, mirror etc. Bathroom lighting enlightens your bathroom as well as your mood. Proper lighting in bathroom creates the desired effect as you always want. A well lit bathroom looks simply great and ensures your safety. Read many wonderful trendy lighting tips for your bathroom. A home steam bath can be installed into a new construction or in an existing one. You can install a modular steam bath or portable steam bath if you are remodeling your bathroom. Portable steam bath is a great choice for small apartments. A soothing color in bathroom refreshes our body and mind and adds to the grace of bathroom. Stimulating bathroom color schemes like blue, orange turn your bath into rapture. Bathroom is a place of recreation rather than a space to bathe. The bathroom has become an essential living space in today’s home.